Tim Groseclose has a video posted at Prager University postulating a relationship between tax rates and revenue. It’s relevant to Hauser’s Law, which shows the relationship between tax revenue and income. What’s an economic discussion doing on the Anti-Republican Culture site? It’s all about testing our beliefs. Mitt Romney makes a pledge to keep government spending constrained at 20% of GDP. That’s in line with what is shown by Mr. Hauser. If government can’t extract more than 20% in tax revenue, don’t spend more than 20%. That’s the spending side. On the income side, Mr. Romney wants to make permanent 20% cuts in marginal tax rates. That assumes tax revenue increases with lower tax rates. Mr. Romney believes America is to the right of the hump in the Laffer curve. And that’s where there is controversy. Where is that Laffer curve “hump?” If it’s in the 33% area, Mr. Romney is right. If it’s in the 50% area, the Democratic Party is correct. How do we find out? I guess we try to “tax the rich” and watch human nature come into play. Can “the rich” avail themselves of more tax-avoidance schemes than the rest of us? I imagine so, and this makes them more sensitive to the Laffer curve. When increases in tax rates cause their net income to decline, they adopt the necessary tax-avoidance strategies. Regular working people might not be able to stop working, but “the rich” will move their wealth into tax-free securities. What’s the effect? The Laffer curve will exhibit “dynamism.” The hump moves left or right depending on tax policy, and – this is immutable – increasing overall tax rates moves the relative position of the hump to the left. That may take an understanding of the mathematics of derivatives, but just realize that the slope of the curve begins at a peak value of one, and decreases from there. 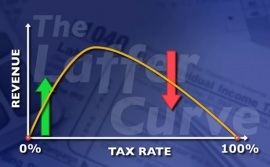 Where the curve peaks with a slope of zero – the “hump” – is a function of our response to overall tax policy. The Laffer curve is simply modeling human behavior. It shows that if we get to keep more of what we earn, we keep doing what we’re doing. If we get to keep less of what we earn, our sense of fairness causes us to look for alternative behaviors. Tim Groseclose has a way of making the argument in a non-threatening way, but it is devastating. What kind of masochist wants to re-elect president Obama just to see him proved wrong? My wife and I went to see the Clint Eastwood film that is the title of this post. It's a sweet movie, in the tradition of Gran Torino (with less bloodshed). And who doesn't like baseball? I don't mean to give economics a bad name, but when you've got the National Bureau of Economic Research showing the hump in the Laffer curve always at a tax rate of 60% or greater, and Mr. Groseclose saying it is closer to 33%, shouldn't someone in academia be interested in resolving that discrepancy? What about Mr. Hauser? If Americans historically balk at giving up more than 20% of GDP in federal taxes, shouldn't that appear as a discontinuity or inflection point on the Laffer curve? Remember, "The Curve" is meant to model economic behavior, not to be an ironclad law. Have we gotten things turned around?